I have sparse and short lashes. Most of the time, my lashes are almost non existent. Without mascara, my eyes would look tired and sleepy. I can't believe that I have finally found the best waterproof mascara. This has replaced my love for Heroin Make Mascara. I am very certain that this is one of the best waterproof mascara I have ever tried (so far). Well, I may be exaggerating but this mascara just wowed me. It makes my lashes look fuller and longer as if I am wearing falsies. Can you guess what is? Tada! It is the Etude House Lash Perm Curl Fix Mascara in Black (01). This costs 848.00 (ang mahal niya for a mascara.. I know but this is worth every penny). It was my first time to try an Etude House Mascara and I am very impressed. I was in a hunt for a nice waterproof mascara for my wedding. I was very certain that I will be purchasing the Heroine Mascara until I tried this a week ago. This mascara has a very unique comb which is an oval plastic/jelly comb brush. One side has long bristles while the other has smaller bristles. The brush come itself is slightly smaller than the regular mascara brushes. The unique brush shape and bristles of this mascara makes it easier to brush or comb through the lashes. The brush shape also prevents clumping. This mascara holds my curl for almost the whole day!! It is also waterproof and smudgeproof which makes it the best candidate for my wedding mascara. The only thing I hate about it is that it is very very very hard to remove. I need to soak it with my Pond's Cold Cream for a few minutes then I have to massage the cream on my lashes before rubbing it off. I repeat this process 2-3 times. Waaah Since I am not a fan of waterproof mascara, I do not use this everyday. Gamit ko lang siya pag bet ko rumampa. Char!!! The first time I wore it I got a lot of compliments saying that I look blooming and fresh. I knew this mascara was the secret because my eyes look really awake. The first time I tried this mascara on I was squealing with excitement. 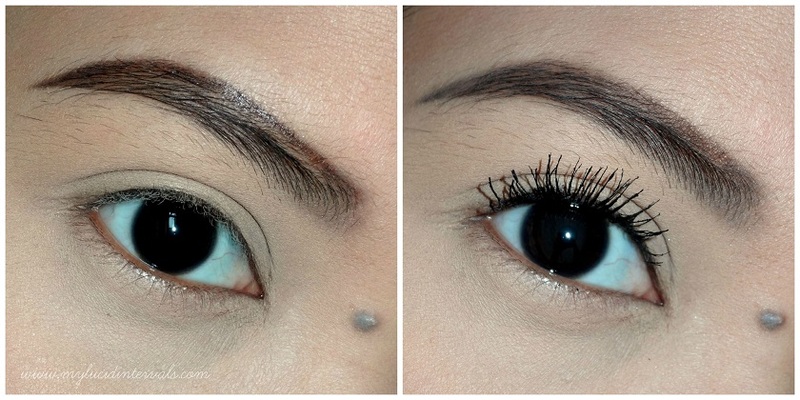 Kabogera itong mascara na ito swear!! it makes the eyes beautiful..ganda I wanna try this too when I will buy a set of makeup in Etude.. I know you're trying to review the mascara pero ang napansin ko ay ang iyong kilay. Ang ganda ganda ng kilay mo! I sooo agree that this mascara is amazing! My HG mascaras before this were L'oreal False Lash Miss Manga & Majolica Majorca Lash Expander Edge Meister. Both were wonderful, but Etude House's Lash Perm Curl Fix does the job of elongating my super short lashes waaaaaay better. As if I'm wearing falsies.